Maple sugaring time at HIllside Homestead. Step back in time at Hillside Homestead and experience a small-scale maple sugaring. This all-inclusive, hands-on weekend offers an authentic getaway which will be educational, fun and super tasty! 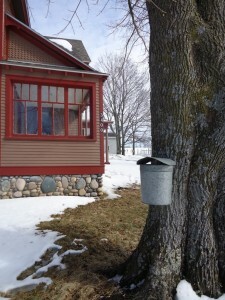 We will set taps in the maple trees around the farm house and collect the sap. Inside on the wood cook stove we will boil that sap down to syrup and maybe even reach the successful sugar stage. We will make maple cream and maple snow candy. Of course we will be tasting our maple products as we go! Maple sugaring is a fun way to get outdoors during late winter. All meals are included and even late night snacks as we sit by the wood stove and relax. 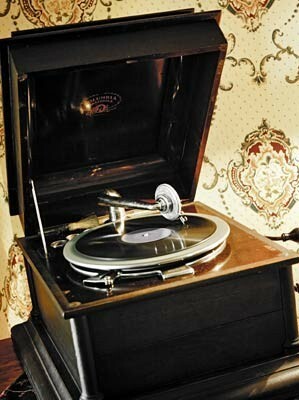 Breakfast will feature waffles with syrup and our homemade maple syrup cured bacon, all hot from the wood stove! 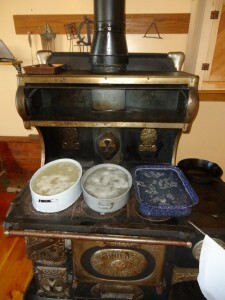 You will also have the chance to learn some basic wood stove cooking as you can help prepare meals if you desire. Outside, in the farm yard there are chickens, ducks and geese to tend. 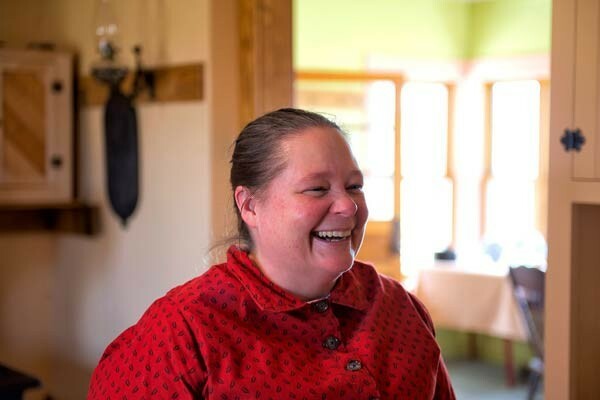 Our Maple Sugaring FarmCation is a unique immersion experience and will create lifelong memories. 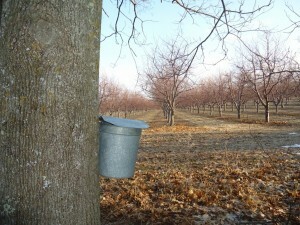 A galvanized steel maple sugar bucket used for collecting sap, all with a lovely orchard view. March 18-20, 2016. Arrive between 4pm and 7pm on Friday. Program over at 11am on Sunday. Two nights lodging is included. Either single or double occupancy. Four guest rooms available. All meals included, supper on Friday night. Breakfast, lunch and supper on Saturday. Breakfast on Sunday. Of course snacks are always available. 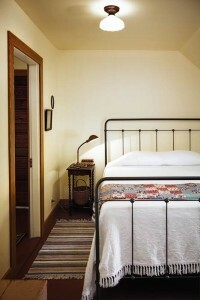 The Orchard room, one of the four guest rooms at Hillside Homestead. A full schedule of maple sugaring based activities with time for relaxing too. Lots of farm fun. We can make time on Saturday for some Leelanau Peninsula exploring if we like. $600 for single room-occupancy and $800 for double room-occupancy. This price is all inclusive. Please contact Susan Odom at 231-271-1131 or susan@hillsidehomestead.com to make a reservation or to ask questions. A deposit of half is due when making the reservation and the other half upon arrival. If you cancel less than two weeks before the FarmCation you can apply your deposit to another event or stay. If you cancel within five days of the FarmCation you forfeit your deposit.